Have you ever wondered how much Britons spend weekly on dining out and takeaway ? Likely more than you think! 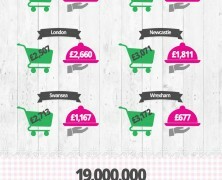 RestaurantChoice.co.uk give us a rundown on what the UK spends on food each week. Why not have a look and see if you match up with the rest of the nation. It is estimated that 21 million people in the US suffer from Gluten intolerance. This infographic examines the current state of gluten-free market in the US and alerts restaurant owners about the emerging opportunities from adding gluten-free option to their menus. New York, a metropolis with plenty tasteful temptations and a great variety of cuisine options all available at various price ranges. Food safety is major concern for New Yorkers and thus they developed a merit rating system for restaurants as a measure against the rise in foodborne illness. See how it works. 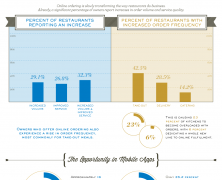 This report examines the trends in the online and mobile restaurant arena and what they mean for today’s food service industry.